Albrecht Incorporated is a 5th generation family business founded in Akron, Ohio in 1932. We were founded to acquire, develop and manage the real estate assets of a related family business, The Fred W. Albrecht Grocery Company, which operates today as Acme Fresh Market grocery chain. The main challenge we wanted to solve was to create a remote desktop connection to users’ computers from my office. 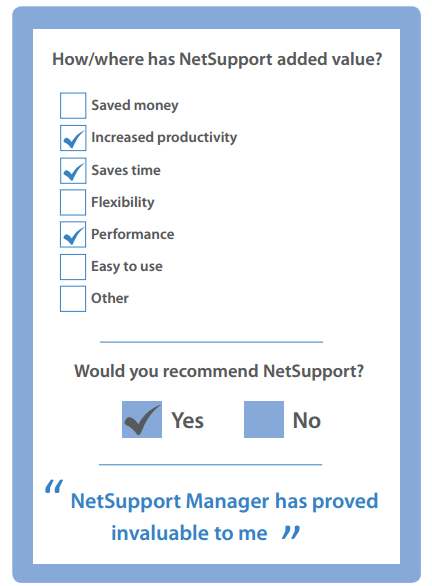 NetSupport Manager is very cost effective and you’re not obligated to buy licenses in a block. It was fairly easy to set up initially, but became more so as upgrades were made to the product over time. I use it to remotely manage users’ desktops in our office and at our remote office and troubleshoot issues they are having, install updates to software, etc. I don’t use all of the features, but NetSupport Manager has proved invaluable to me. We are a small company and my time is stretched between many projects. So the time I’ve saved troubleshooting issues has been invaluable. We have used the software for many years and have not had any problems with it. NetSupport Manager has meant increased productivity for me and the user. I don’t have to travel to remote locations or users’ desks to investigate issues. I can work on more than one issue at a time by logging into multiple computers at the same time, meaning that the user’s issue can be resolved sooner.